Vibratory Feeders provide an efficient and economical method of conveying bulk materials and offer a simple and easy means of controlling their rate of flow. Rugged and dependable – Manufactured and proven on C-Mac Bagging Machines for many years. Typical applications include feeding to packaging, batching, mixing, drying and similar applications. Hot and cold materials are easily handled. A Feeder consists of a Trough attached to a drive via Leaf Springs within the drive the trough is vibrated at high speed by an electromagnet inside the drive. The magnet pulls the trough sharply down and back – then the springs return it up and forward to its original position. As the trough is pulled back and down, the material falls vertically to a new position forward in the trough. This action repeated at high speed causes the material to flow. Extremely accurate feed rate controls are an additional benefit of the electromagnetic feeder. These highly reliable feeders are rated for continuous duty and provide a constant feed rate even under varying head loads and with different material characteristics. Very low maintenance requirements with few moving parts, no lubrication or greasing. Maintenance is kept to an absolute minimum. 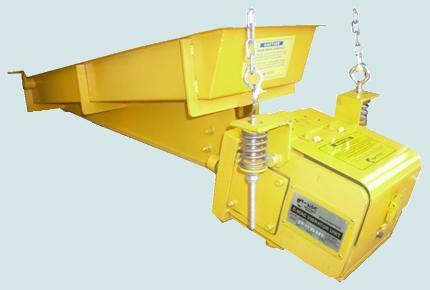 Hoppers can be made to suit customer specifications for the electromagnetic vibration feeder.